Well, this is something of a guilty pleasure: an anthology with the subtitle Bigs Ships. Blowing Things Up. It’s the kind of thing you didn’t even know was missing from your life until you see it. In “Superweapon” by David Drake, a fight for possession of an ancient alien warship will determine the fate of two vast interstellar powers. Then in “Hate in the Darkness” by Michael Z. Williamson, a team of libertarian Freeholders must think outside the box to do battle with the might of the United Nations and its powerful navy. And in “A Helping Hand,” Jody Lynn Nye posits an interstellar submarine on a rescue mission behind enemy lines — with the fate of an entire species hanging in the balance. If you like modern space opera — and really, who doesn’t? — this book is Bean’s gift to you. 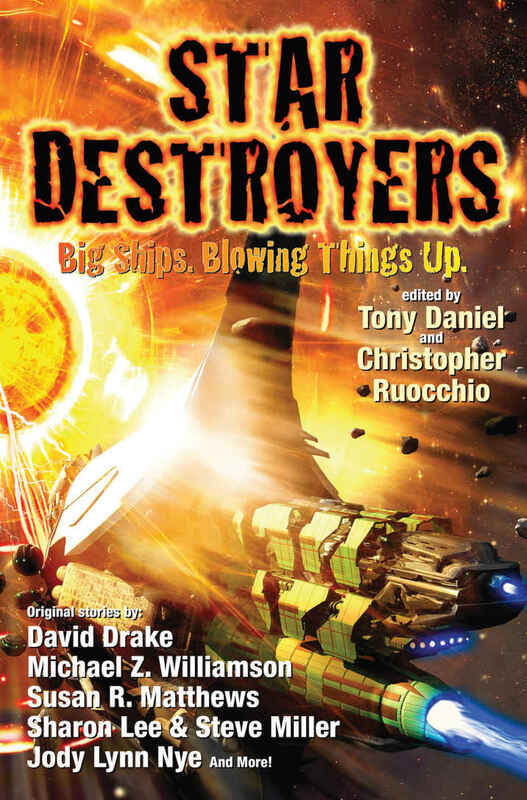 It contains stories from 15 top-notch writers, most of whom have ongoing space opera series from a wide range of publishers, including Dave Bara (DAW), Christopher Ruocchio (DAW), Robert Buettner (Orbit), Mark L. Van Name (Baen), and many others. Here’s your chance to try a rich smorgasboard of writers under one cover, and maybe find yourself a few new favorites. Star Destroyers was published by Baen Books on March 6. It is 336 pages, priced at $16 in trade paperback and $8.99 for the digital edition. The cover is by Kurt Miller. Read a generous sample from the book at the Bean website.